Virginia’s D.C. suburbs are playing host to one of the most competitive contests in the region this election season as first-term Rep. Barbara Comstock battles with Democratic challenger LuAnn Bennett. Editor’s note: This article is part of a WTOP series previewing races and ballot measures and providing voting information for residents of D.C., Virginia and Maryland. 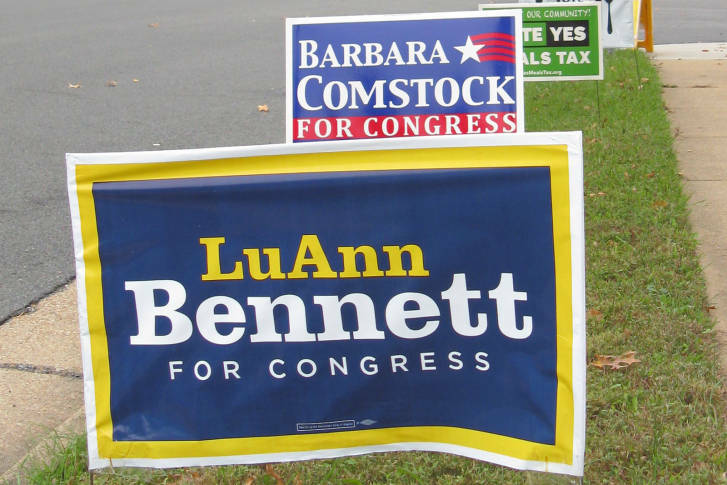 WASHINGTON — Virginia’s D.C. suburbs are playing host to one of the most competitive U.S. congressional contests in the region this election season, as first-term Rep. Barbara Comstock (R) battles Democratic challenger LuAnn Bennett to represent the 10th District. Voters in each of the state’s 11 districts will help choose their next representatives to Congress. Rep. Gerry Connolly, D-Fairfax, is the only candidate running unopposed. He represents Virginia’s 11th District. Three seats — those in the 2nd, 4th and 5th districts — have no incumbent running this year. Control of the U.S. House of Representatives could be at stake as Democrats are expected to chip away at Republicans’ advantage. But 30 seats throughout the country would have to flip for Democrats to win the chamber. Comstock and Bennett hope to represent Virginia’s 10th District, which stretches from the D.C. suburbs to the Shenandoah Valley. Long represented by Republican Frank Wolf, this year’s divisive presidential campaign coupled with changing demographics in the district have made the district more competitive. For months, the candidates and their surrogates have been attacking one another through a series of ads and mailers. And as of the end of October, the campaigns and political action committees have spent a combined $14 million on the race, according to Open Secrets, which tracks federal campaign spending. The two have sparred over health care costs, abortion, taxes, Bennett’s track record as a real estate developer, Comstock’s stance on Donald Trump and the question of who has done more to promote equal pay for women. Comstock, a Republican who handily won her first election to Congress two years ago, has focused on her ability to work across the aisle, especially with her many D.C.-area colleagues who are Democrats, and her years of public service. Comstock worked for Wolf and later served in the Justice Department. She also represented northern Fairfax County in the Virginia House of Delegates for five years. Bennett is president and owner of Bennett Group, a real estate management and development company based in D.C. She has emphasized her background as a small business owner and wants to see Congress make “tough” decisions, pass budgets and use big ideas to solve the nation’s problems. Comstock has tried to distance herself from the man at the top of the Republican ticket, and said she would stand up to either of the presidential nominees, whom she called flawed candidates. For her part, Bennett has also pledged to work with Republicans and Democrats alike if elected. But she has criticized Comstock for not publicly distancing herself from Trump sooner, and has linked their policy goals through mailers, ads and on the campaign trail. “If you don’t like Donald Trump’s agenda, you shouldn’t like Barbara Comstock’s either,” Bennett said. Bennett has touted the benefits of the Affordable Care Act but wants to see the law improved. She also wants Virginia to expand its Medicaid program to provide insurance coverage to more low-income Virginians. Comstock wants to allow Americans to buy their insurance across state lines and to allow small businesses to pool together to buy insurance coverage, reducing their costs. Americans should be able to contribute to health savings accounts — benefits many workers have through their employer. Both women agree that the federal government should be investing in research and technology development, particularly for alternative energy sources. But they differ on solutions. Comstock favors tax credits that encourage businesses to undertake such efforts. She doesn’t support regulating greenhouse gas emissions and wants the nation to have access to affordable energy. Bennett wants to see the country get ahead of what she calls the green energy transition and begin to manufacture wind turbines and solar panels domestically, rather than import them. Both candidates would reform the nation’s tax code to make it fairer and simpler. Both agree that the corporate tax rate should be lowered. Republican Rob Wittman is running for a fifth full term in Congress. He faces Bowling Green Town Council member Matt Rowe, a Democrat and GIS analyst. Independent candidate Glenda Gail Parker is also running. The district includes portions of Prince William, Fauquier, Stafford and Caroline counties. Wittman has spent more than $800,000 on his re-election race. In comparison, Rowe has spent more than $34,000, according to Open Secrets. State Sen. Tom Garrett of Buckingham County and Jane Dittmar, a former Albemarle County supervisor, are vying for an open seat in Virginia’s 5th District. Congressman Robert Hurt chose not to run for a fourth term. The Republican-leaning district includes much of Fauquier County and stretches south to the North Carolina state line. Dittmar has spent more than $1 million so far, more than double the $438,000 Garrett has spent, according to Open Secrets. Democrat Don Beyer is seeking his second term in the House. He faces Republican Charles Hernick, an environmental consultant from Arlington County. Independent candidate Julio Gracia is also running for the seat. Beyer previously served as Virginia’s lieutenant governor and more recently as ambassador to Switzerland for the Obama administration. Beyer has spent $1 million to Hernick’s nearly $62,000, according to Open Secrets. The heavily Democratic district includes Arlington, Alexandria, Falls Church and parts of Fairfax County. To see the list of candidates in Virginia’s other districts, visit the state’s official election website. In Virginia, the polls open at 6 a.m. and close at 7 p.m. on Tuesday, Nov. 8. Voter registration in Virginia has closed. Registered voters who qualify can cast an in-person absentee ballot through Saturday. Paper absentee ballots must be submitted to local registrars by 7 p.m. on Nov. 8. The Virginia Department of Elections has more information about the qualifications to vote absentee here. Look up ballot information or polling locations here.